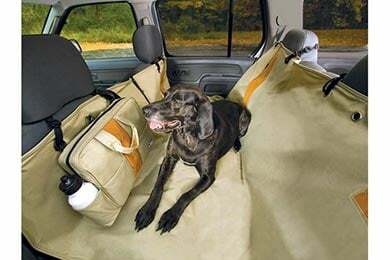 Discover the right dog seat cover for your ride. So what are the best car seat covers for dogs? That's a tough question, and, ultimately, it depends on your style and your dog’s travel preference. There are more choices than you can shake a stick at. And best yet, they will make having Fido along for the ride a joy for you both. There’s the Kurgo Wander Hammock that allows your pup to realize his wanderlust. A dog hammock allows pets to ride in total relaxation and allows you to stop thinking about the potential for scratches and tears in that buttery leather interior. Now that's a load of worry off you mind, huh? Why stop there? Not only are there protective products made just for your car seats, but there are restraining devices that will help keep Rover calm as can be. 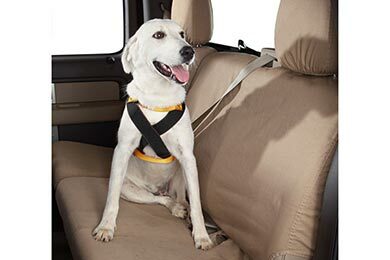 There are dog seat belts, dog travel harnesses and even an SUV dog barrier. All of these devices keep pets in place, ensuring a safe arrival for both your dog and your driving machine. So, it's safe to say that they're definitely a worthwhile investment. What are you waiting for? Choose from some of the best car pet seat covers on the market and hit the road. Bust some tunes from Lobo and drive with peace of mind knowing Boo can run for miles down those winding clay roads, and when you’re ready to pack it up and head home, clean up is a breeze. The only remnants of those brick-colored paw prints easily come out in the wash—leaving you with nothing but sweet memories. And you can also read tons of dog seat covers reviews to see what our actual customers are saying about their dog seat cover products. The fit of these seat covers is great. At first, we thought the bottom was too short but after a few days, it softened and settled into place. We are leaving it in place rather than putting it on and taking it off every time our Corgi is in the car. Everything was as expected. The size and material was as good as advertised. The only thing I would change was the size of the bungee cords. They should be a bit thicker, but the ones I got still worked. For the money, it's the best choice. My dog took no time getting used to it! Reference # 763-681-666 © 2000-2019 AutoAnything, Inc.